I feel like the developers at Klei Entertainment really wanted to make a survival horror game and messed up somewhere down the line in a good way. Normally titles in this genre involve characters trying to live through a horrific experience with only their physical prowess and weapons to defend themselves. 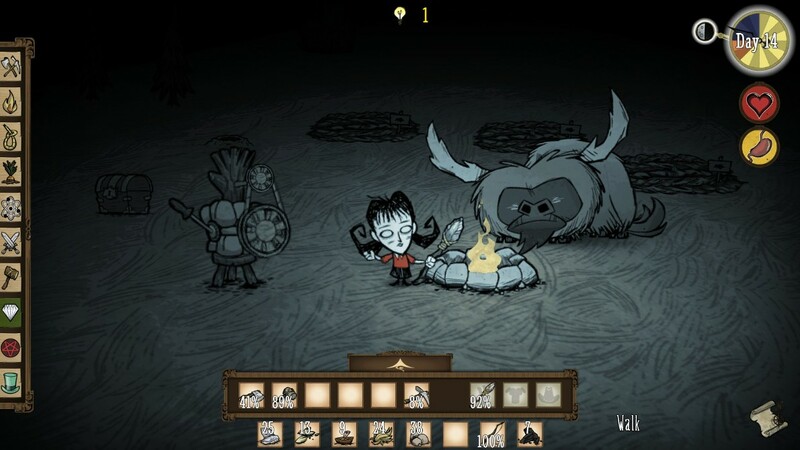 With Don’t Starve, Klei decided to take the survival aspect very seriously, but remembered they were making a “survival horror” game and threw in every monster they could think of for good measure. What popped out of the Klei machine was something that doesn’t look like anything else out there. It’s so wrong, yet so right. The game has been in beta for many months, available for free to customers who pre-ordered on Steam. Slowly Klei has been fleshing it out, adding features and fixing bugs, and now it’s finally available in its completed form for PC. I’ve had the beta since late 2012, and have been eagerly waiting for the final version. Even while playing an incomplete product, I could tell that I would be pleased. Don’t Starve follows your character—Wilson, the Gentleman Scientist—after he is dropped into the wilderness by a demon named Maxwell. Maxwell performs his only real purpose—telling you that you need to find food before nightfall—and then disappears. You then have to use the environment and your wits to collect materials, food and objects in order to survive starvation, insanity, constantly growing facial hair and the hoards of monsters that show up. Previous Post Previous post:Why is there still geek shame?